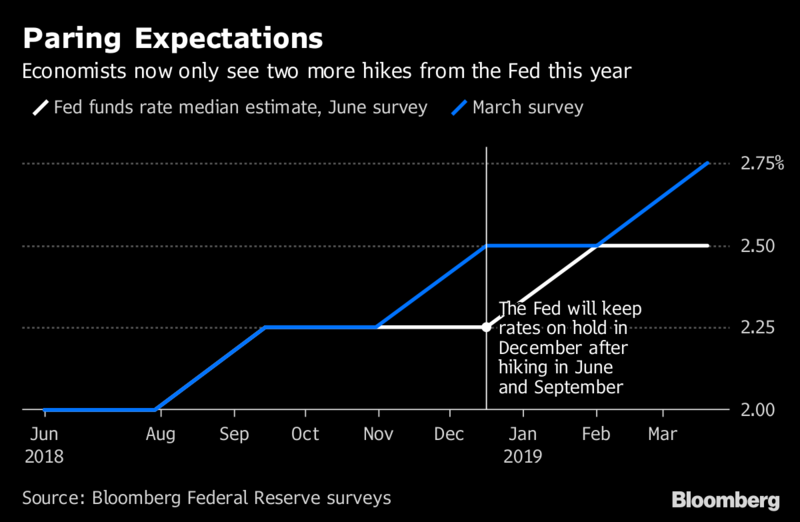 The Federal Reserve won’t steepen the path of interest-rate increases this year in the face of accelerating U.S. growth, according to economists surveyed by Bloomberg. In a poll conducted June 5-7, the proportion of respondents who expect at least three additional rate hikes in 2018 dropped slightly, compared with the survey in March. The median estimate from economists now sees two more increases this year, which matches the Fed’s own projections back in March. All 37 respondents predicted a quarter-percentage-point rate hike when policy makers conclude their two-day meeting in Washington on Wednesday. “GDP growth could be 4 per cent in the second quarter, but we also had a punky-looking first quarter,” said Brian Horrigan, chief economist at money manager Loomis Sayles & Co. in Boston. Concerns over trade disputes, persistently sluggish inflation, a strengthened dollar and strains in emerging markets will also discourage the Fed from reacting more aggressively, he said. 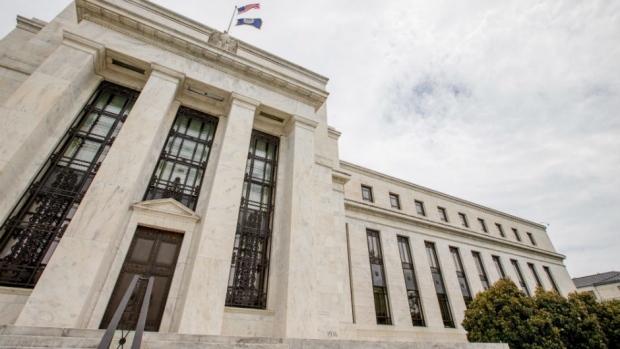 Fed officials will release fresh quarterly economic forecasts and interest-rate projections following their meeting. Thirty minutes later, Chairman Jerome Powell will begin his second press conference since taking the helm in February. With the U.S. economic expansion now the second-longest on record, the central bank is gradually removing crisis-era policy stimulus. Unemployment has fallen to match the lowest levels since 1969 and inflation is back at the Fed’s 2 per cent target. Growth this year is likely to be further boosted by US$1.5 trillion in tax cuts and $300 billion of additional federal spending signed by President Donald Trump. Economists foresee some modest upgrade to the Fed’s economic forecasts. The survey showed they expect Fed officials will move up their median estimate for growth to 2.8 per cent in 2018 from 2.7 per cent expected in March, slowing to 2.4 per cent in 2019. When it comes to possible alterations in the Fed’s post-meeting communique, respondents overwhelmingly said the statement will continue to characterize near-term risks to the economy as “roughly balanced.” That’s up from about half of the economists surveyed in March. The change also aligns with the economists’ own assessment that risks to monetary policy were more balanced compared to March. The level of respondents indicating risks were tilted to the upside declined to 52 per cent from 71 per cent. Minutes to the last two Fed policy meetings showed officials have begun to discuss how and when they will drop longstanding language in the statement indicating “the federal funds rate is likely to remain, for some time, below levels that are expected to prevail in the longer run.” Asked when that clause might be substantially changed or dropped, one third of economists in the survey saw that happening at this week’s meeting, with 22 percent expecting the alteration to take place in September. Economists showed more unity, however, in assessing risks to financial-market stability. In March, a steep stock-market decline was the top concern, picked by 41 per cent of respondents. That dropped to 15 per cent in this survey, while a disruption in external trade relations jumped to 55 per cent from 36 per cent. Samuel Rines, chief economist at Avalon Advisors in Houston, said he worries that a significant dispute with China could provoke Beijing to turn once again to currency devaluation. “That’s where you’d get the ripple through to financial markets,” he said.